Nicolas Badalassi and Sarah B. Snyder will introduce their new edited collection, The CSCE and the End of the Cold War: Diplomacy, Societies and Human Rights, 1972-1990, which brings together senior and junior scholars from eight countries to reflect on the significance of the Conference on Security and Cooperation in Europe (CSCE) to the end of the Cold War. Notably, the book includes one of the first examinations of why Albania did not participate in the Conference on Security and Cooperation in Europe. 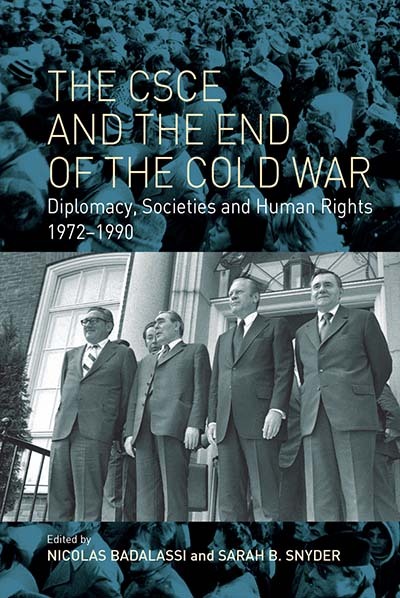 It highlights the varied and understudied contributions of diplomats to the Helsinki process and demonstrates how diplomatic agreements can have profound impacts on society and effect political change. Nicolas Badalassi is Associate Professor of Contemporary History at the Institut d’Etudes politiques in Aix-en-Provence (France). He holds a PhD from the University Paris - Sorbonne Nouvelle (2011). He has published various articles concerning French foreign policy in the Cold War era and the Helsinki Process. Main publications: En finir avec la guerre froide: La France, l’Europe et le processus d’Helsinki, 1965–1975 (2014); Les pays d’Europe orientale et la Méditerranée, 1967–1989 (2013, coedited with Houda Ben Hamouda); The CSCE and the End of the Cold War: Diplomacy, Societies and Human Rights, 1972-1990 (2018, coedited with Sarah B. Snyder). Sarah B. Snyder teaches at American University's School of International Service. Her second book, From Selma to Moscow: How Human Rights Activists Transformed U.S. Foreign Policy, was published by Columbia University Press in 2018. Her first book, Human Rights Activism and the End of the Cold War: A Transnational History of the Helsinki Network (Cambridge University Press), won the Society for Historians of American Foreign Relations' 2012 Stuart Bernath Book Prize and 2012 Myrna F. Bernath Book Award. Berghahn Books recently published a collection (edited with Nicolas Badalassi) on the Conference on Security and Cooperation in Europe and the end of the Cold War.